On December 8, 1941, Japanese forces invaded the Philip­pines, a largely self-governing U.S. pos­ses­sion. (Decem­ber 8, Manila and Japa­nese time, was the same date Japa­nese car­rier-based planes attacked Pearl Harbor, Hawaii, in a set of inter­locked assaults on U.S. mili­tary assets in the Paci­fic region.) The com­bined U.S.-Filipino force led by Gen. Douglas Mac­Arthur could not check the Japa­nese advance and with­drew onto the Bataan Penin­sula, across the bay from the Philip­pine capital Manila, where they held out until April 1942. 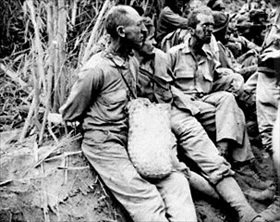 Nearly 80,000 U.S. and Fili­pino troops went into Japa­nese cap­tiv­ity, many of them mur­dered or dying from ex­haus­tion, dehy­dra­tion, expo­sure, and the bru­tal treat­ment by their captors on the sub­se­quent four-day, 80‑mile “death march” out of Bataan to inland prison camps. The last-ditch U.S. strong­hold, the tad­pole-shaped “rock” of Cor­reg­idor in Manila Bay, finally sur­ren­dered its booty of 16,000 Amer­i­can and Fili­pino sol­diers on this date in 1942. The drawn-out fight in the Philip­pines forced Japan to com­mit more troops than planned to cap­ture an ob­jec­tive far less im­por­tant to their ambi­tions of securing the great min­er­al resources of Brit­ish Malaya, over­whelmed in mid-Janu­ary 1942, and the Dutch East Indies (Indo­ne­sia), which surrendered on March 9, 1942. In the months pre­ceding the out­break of hostil­i­ties, Japa­nese ex­pan­sionists and policy­makers had counted on the antic­i­pated suc­cesses of their early mili­tary oper­a­tions in South­east Asia to nudge the West­ern colo­nial powers to sue for peace after hostil­i­ties had broken out. When that didn’t happen, the san­guine apprai­sal of how Japan was going to win the Paci­fic War it had started morphed into an­xiety and later des­pair. Fully 80 per­cent of Japa­nese troops remained tied down in a ground war in China that Japan had started in 1937. The rest of the army and the Impe­rial Japa­nese Navy now had to con­tend with a mas­sive build­up of a revived U.S. Paci­fic Fleet, as well as con­verging attacks by U.S. and British Com­mon­wealth forces from one retaken Paci­fic island after another. In the end, the bushidō spirit (“warrior spirit”) that the Japa­nese fell back on as their for­tunes turned bleaker by the month could not trump the Allies’ supe­rior strength in arma­ments and fighting men, a com­bi­na­tion that secured the Allies victory over Japan in September 1945. 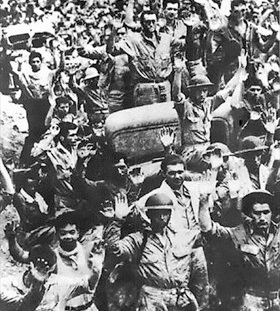 Left: American and Filipino troops surrender to Japa­nese in­vaders on Bataan. The three-month Battle of Bataan (Janu­ary 7 to April 9, 1942) resulted in the largest sur­ren­der in Amer­i­can and Fili­pino mili­tary his­tory, and was the largest U.S. surrender since the American Civil War. Right: Route taken during the Bataan Death March. 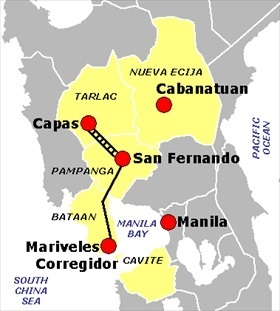 Section from San Fer­nando to Capas was by rail, and from there to Camp O’Don­nell 9 miles further by foot or truck. Another POW camp was located near Cabana­tuan City, where as many as 8,000 Amer­i­can and other Allied POWs and civilians were imprisoned. 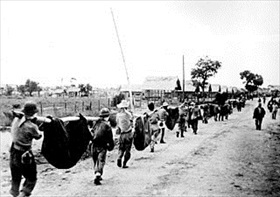 Left: U.S. soldiers, their hands tied behind their backs, rest on the Bataan Death March to their prison camp at Cabana­tuan. Approx­i­mately 2,500–10,000 Fili­pino and 100–650 Amer­i­can pri­soners of war died from thirst, wounds, dis­ease, and their cap­tors’ savage mis­treat­ment, including executing stragglers, before they reached Camp O’Donnell.